Dexway Blended Learning Method combines face to face classes with online training. A method which recreates real-life situations organized in a learning environment combining multimedia content with live interaction. The student’s language skills develop naturally through structured lessons. Student progresses during each lesson at their own pace starting with vocabulary warm ups and gradually building up to more complex exercises. This system allows progressive and flexible learning of grammar rules, lexical and phonetic concepts through practice. Before starting the course with our Dexway Method, the student will complete a placement test that will position them in a level suited to their language skills. This online assessment is based on the guidelines of the CEFR and indicates what course level is most appropriate for the student. Dexway courses, in all forms, are composed of educational video-based lessons and interactive exercises for a fun structured learning experience using real-life situations in a highly intuitive multimedia environment and specifically developed for language training. Dexway courses are structured so that they become increasingly more difficult, allowing a sequential, orderly and intuitive progression designed to strengthen all the language skills both of oral communication (listening and speaking), and written communication (reading and writing). However, in addition, the student can practice each of these competencies or skills in a personalized way, depending on the learning experience they want at the time. Dexway utilizes the most complete and reliable pronunciation evaluation system on the market. Firstly, our voice recognition software analyzes the student´s pronunciation, and automatically corrects and suggests how to improve it. Dexway courses have a support system in the initial courses, in the language of the student, to facilitate better understanding of all the elements of the content. The support system can be enabled or disabled by the student at any time. Each unit has access to the grammar studied in each lesson and unlimited access to the grammar from previous courses with the aim of providing students with constant assistance. Students also have access to a manual that contains grammar content for the whole course. The reference book is available online and can also be printed. One of our keys to success is to get students to talk, talk and talk with our Dexway Method. Dexway courses are complemented by conversation practice which allows the student to practise the language being studied with your teachers and other learners in a high-quality virtual environment which includes audio, webcam, whiteboard and live chat. 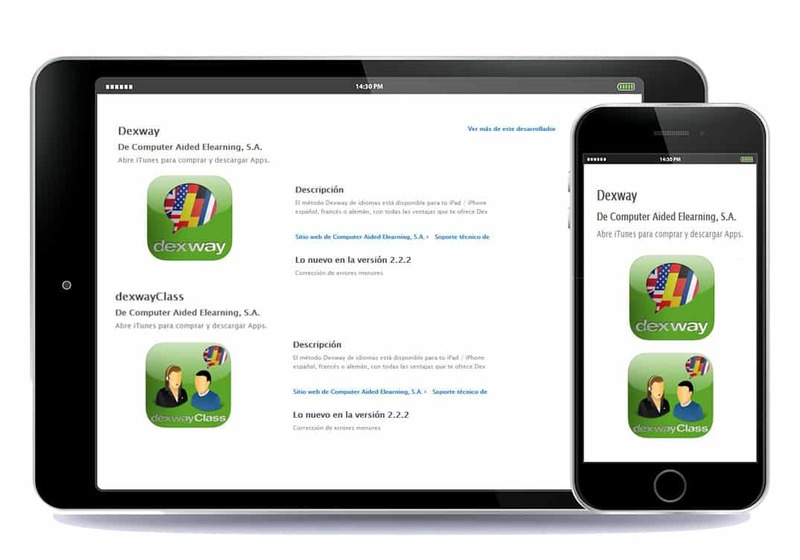 Dexway students can participate in conversation classes with your teachers throughout the course. In this way, students practice their oral expressions and give opinions on various topics and interests, specifically designed for their level. The students only need to enroll in one of the many conversation classes that are scheduled for their level, which are offered every day of the week. The classes can be in group or individual. Dexway students can speak with other students from around the world, in the language level they are studying, anytime they want and with no time limit. Students can meet freely in the virtual rooms to practise conversations at any time. Dexway is currently a large community where students from different parts of the world are networked. Our students can ask questions and share experiences with other students as well as invite them to participate in meeting rooms to discuss topics. Also, their participation in the community is a source of motivation to advance in the course thanks to our system of awards, achievements and reputation ratings. Dexway prepares students to achieve the desired level and helps them visualize their progress through unit tests and final evaluations. Dexway courses prepare students so that they can perform the most recognized certification tests (Official Language School, ACLES, University of Cambridge, etc…).